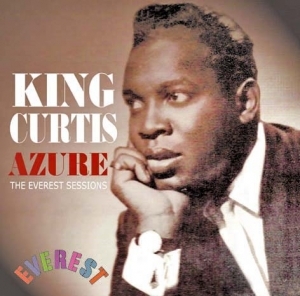 For the first time on CD the rare Everest LP, “Azure” by the legendary saxophonist King Curtis, recorded in 1960 and released in 1961. Curtis was until his murder in 1971 one of the most popular R&B saxophonists in the world thanks to his appearance on countless hit records in the late fifties and early sixties. Classic solo recordings such as “Memphis Soul Stew”, his production work and his long term role as Aretha Franklin’s musical director had thrust him into the global spotlight. When he recorded this mainly easy listening orientated album featuring such standards as “Unchained Melody”, “Misty” and “When I Fall In Love “he was still a year away from his first hit “Soul Twist”. He recorded a single for Everest after the albums release, “Jay Walk”/”Lone Prairie” and we have added these two tracks to the original album. After “Soul Twist” hit on Enjoy Records Everest reissued “Jay Walk” on their Alcor label. These long sought after recordings fill a gap for King Curtis collectors after many years of waiting.